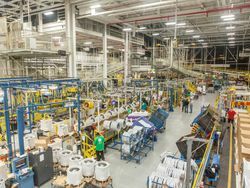 More than a total of 150 middle- and high-schools classes from Greater Louisville participate in a first-of-its-kind virtual tour of Appliance Park. Other Manufacturing Month activities are planned with Junior Achievement to expose both middle- and high-school students to the career opportunities in manufacturing. LOUISVILLE, Ky.—October 7, 2016—“You must be 18 to enter” doesn’t apply to middle- and high-school students who will get an insider’s look at Appliance Park manufacturing operations on October 7. GE Appliances, a Haier company (GEA), has engineered a way to expose students to the high-tech, fast-paced environment of one of the region’s largest manufacturing sites and the types of career opportunities that await them, without breaking GE Appliances’ long-standing workplace safety guidelines and without 4,500 students leaving the classroom. October 7, Manufacturing Day, in the United States and Canada, is designed to celebrate modern manufacturing, to educate and inspire the next generation of manufacturers. It is an opportunity for manufacturers to open their doors to show what manufacturing looks like today – with the goal of dispelling misconceptions that have discouraged students—and their parents—from considering careers in this dynamic field. Today, students from 150 classrooms that include Jefferson County Public School (JCPS) middle schools, Doss High School's new manufacturing technology program—which GE Appliances helped launch with funding for Amatrol manufacturing training equipment—and the Mt. 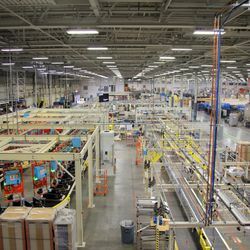 Washington Middle School will participate in a virtual field trip which showcases 3D printing in action in one of the state’s largest rapid prototyping centers, the production facility for the industry’s most innovative bottom freezer refrigerators and a state-of-the-art training facility—all located at the 900-acre Appliance Park in southeast Louisville. 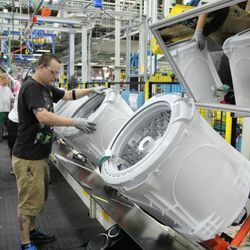 According to the Bluegrass Economic Advancement Movement (BEAM) and the Kentucky Cabinet for Economic Development, the Louisville area’s manufacturing sector is an $11 billion industry, representing 17 percent of the region’s economic activity and 13 percent of regional employment. But Greater Louisville manufacturers are not finding enough qualified candidates to sustain and grow their businesses. According to the Louisville Labor Market Report for 1Q 2016, there were nearly 2,000 advanced manufacturing skilled job openings, which demonstrates not only the demand for these jobs but the opportunity for those who choose a career path in the skilled trades. "The virtual tour offered by GE Appliances is an incredible opportunity for our students and is a tangible example of the strong partnerships JCPS has built with industry leaders in our community," said JCPS Superintendent Dr. Donna Hargens. "Through technology, our students can visit Appliance Park, learn about its operations, see what they are learning in the classroom applied in the real world and get inspired about their future careers. Thanks to GE Appliances for making this experience possible for our students." Junior Achievement (JA) will be coordinating tours of Appliance Park for JCPS high-school students from Doss, Jeffersontown and Butler the weeks of October 3 and 14 with support from GEA’s Women in Supply Chain organization and Advanced Manufacturing Technicians. GEA will have a booth at JA’s Inspire Event, October 26-27, at the Expo Center. This career exploration event for 8th grade students, which is supported by students in GEA’s manufacturing program and Advanced Manufacturing Technicians (AMTs), as well as Amatrol, Inc., who designs, develops and manufactures technical learning systems and hands-on simulators, will be highly interactive and focused on educating them about the skills, training, salaries and career paths at GEA. The goal is that students are inspired to select a high school with manufacturing/engineering programs. For more information on which JCPS schools offer curriculum in skilled trades/advanced manufacturing, please contact Terry Miller at (502) 485-8589. For Bullitt County Area Technology Center, visit http://www.bullitt.k12.ky.us/25/Home. NOTE: See attached April 2016 workforce development playbook that is a continuation of efforts started in 2014 by GE Appliances, the Greater Louisville chapter of the Kentucky Federation for Advanced Manufacturing Education (KYFAME), and Jefferson community and Technical Collage who is now conducting their second class of a work and learn Advanced Manufacturing Technician (AMT) program (see second attachment). 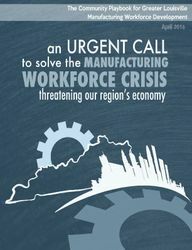 An urgent call to solve the manufacturing workforce crisis threatening our region's economy.